"It's a great camp where you learn about different places and they don't seem that far away!" 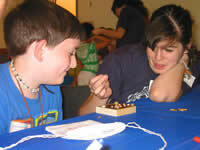 Jake plays Bagh Chal, a game from Nepal, with Camp volunteer Carey, using the game board he designed and decorated, at Kids and Cultures Camp 2009. 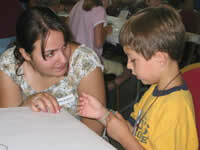 We were new to the area and were looking for some summer camps for Jake who had just finished first grade. We found the Kids and Cultures website, read about the camp, registered and have been coming back each year ever since! A favorite memory: Jake enjoyed learning about Poland since his great grandparents were born and raised in Poland. He loved sharing what he learned with his PopPop who could add his own memories of the traditions and language. Jake is also more open to trying ethnic foods now. He surprises his Nana with the foods he eats! One day last year in camp, he learned about a game from Nepal. That afternoon, he was over at our neighbor's house who is from India. While there, he noticed that same gameboard in our neighbor's house and started to play. Wow, our neighbor was shocked that he not only knew the game, but was good at playing it! Jake comes home from camp and teaches neighborhood kids how to play the different outdoor games. One afternoon, I enjoyed watching a group of kids playing "Bear, are you awake?," a game that he learned that day. The value of the lessons that are learned surpasses the cost of the camp. The activities, foods, language and games that are shared have encouraged our family to explore new cultures. My children participate in our church's Vacation Bible School and area sports camps, but Kids and Cultures is a unique camp that leaves lasting memories for the kids. It's great to see the kids smile and greet each other each year when they get together for camp once again. Jake says, "It's a great camp where you learn about different places and they don't seem that far away!" "It's like traveling to another country and being home in time for dinner"
Photo: Alex (second from right) helps his team play an Egyptian version of Tug-of-War at Kids and Cultures Camp 2007. Hi! This is Lisa along with my son Alex. When it comes time to plan for the summer and I ask Alex what he wants to do there are always two answers: swimming and Kids and Cultures Camp! Kids and Cultures Camp has been a summer highlight ever since he was old enough to attend. I first learned of Kids and Cultures when founders Timm and Kristina Wenger (and family) were guests on my Kids Cookie Break radio show. Finally, I thought, here is an organization educating our kids on world cultures in a fun exciting way! I was so eager for Alex to not only meet friends and learn about world cultures, but also to have him learn about his home country, Guatemala. We adopted Alex from Guatemala when he was a baby. I'm going to turn this blog over to Alex now and he'll highlight his camp experience. Alex: It's hard to chose one favorite camp memory, because there are so many. I did love when we studied Italy. It was a nice touch to bring a person from La Dolce Vita bakery and to learn about Italian food and to be able to sample the foods of Italy. Kids and Cultures camp is so cool and I appreciate the caring counselors. Each year I would look forward to going back to camp to meet more friends and learn about what life is like for kids my age living in other countries. It's so cool to hear that in so many ways they are like me. Some of them eat foods that I have tried to make here at home. I love to cook so I guess I experiment mostly with the foods we learn about in camp. I also like learning about the holiday traditions that kids around the world celebrate. When I was younger I learned at camp that kids in Latin America often celebrate their birthday by breaking a pinata full of candy and goodies. I am from Guatemala so I like to have a pinata at my birthday. I am hoping to be a camp helper this year so maybe I'll get to meet you! Get ready to have a ton of fun meeting new friends, playing fun games, making interesting crafts, and eating yummy food from cool places around the world. Kids and Cultures Camp. It's like traveling to another country and being home in time for dinner. "...Not intimidated by difference, but instead, embrace it"
Photo: Josh and Klodiana Hajdari, our guest from Albania, talk about the spring bracelet that he made at Kids and Cultures Camp in 2006. There is an integral sense of understanding, kindness and curiousty that we believe children need to richly connect with others. Kids and Cultures Camp allows us to give our children a vital perspective as they take a fresh glimpse into the world around them. For one week each summer, without leaving Lancaster County, our children trade in the technology and noise of everyday life for the opportunity to try new foods, savor unique styles of music, speak words in languages they've only heard named and listen to stories of people who share their emotions despite their geographic distance. Josh, age 11, has attended Camp every year since he attained the minimum age to participate. He has clear plans to continue with camp right up through being a volunteer in his high school years. Camp continues to wow him year over year. Sydney, age 7, literally counted down the years until it was her turn to attend Camp. She would listen to Josh recount his experiences and continue to ask when she could participate. At the end of each day, they eagerly await connecting to the Camp web site to view photos of the day's events. There is truly something for every child at Kids and Cultures Camp. 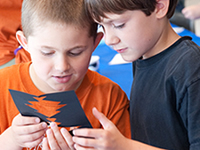 For the creative child, the outlets are endless - scrapbooking, crafts, games. For the child that is active, there are games and many high energy activities. And, for the child whose curiousity is endless, there are countless facts, resources and individuals available to feed insatiable interests. For the daring, there are foods and beverages from all parts of the world - those that surprise the taste buds and those that taste strikingly familiar. All of this is presented not by individuals who have simply read about various cultures, but by individuals whose lives were built upon it. The Camp staff seeks out individuals who can share from their own personal experiences. The authenticity and passion for each culture is contagious. Our children come home each day certain that this world holds amazing treasures. They desire to learn more about people and are not intimidated by difference, but instead, embrace it. We've seen this understanding hold real meaning for our children. In 2006, our family adopted a daughter from India and with that, we adopted a country and a culture. We have been fortunate to have connected with a wonderful community of Indian families who reside in the area. Each year, we attend a Diwali celebration in Lancaster County. This Hindi festival of lights celebrates the arrival of a new year through dance, food and music. During this year's Diwali celebration, Josh ran around playing energetic games with the boys in attendance. Following the evening, we talked about those lively games. Josh shared all the details and with great relief said, "We played one game that I learned at Kids and Cultures Camp. Thank goodness for Camp. Otherwise, I would have had no idea how to play." It was through this game and this understanding of tradition that he was able to further connect with individuals whose backgrounds, family life and traditions are somewhat different from his. It was at this place of connection over a simple game that friendships deepened and understanding brought a sense of togetherness. Without his attendance at Kids and Cultures Camp, it would have played out quite differently. This month, we are beginning to plan our children's summer schedule. This year, as in the past, we begin by placing one event on the calendar - Kids and Cultures Camp. That one is a definite. We work the rest of the summer around it. Our children would have it no other way. 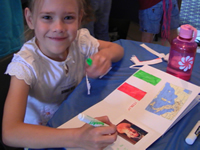 "Camp puts a face to distant countries"
Photo: Hannah designs a scrapbook page to remember Italy, a country featured at Kids and Cultures Camp 2008. Our daughter, Hannah, has attended Kids and Cultures Camp for the last two summers, and it has been a highlight of her summer each time. She loves camp so much that we have to make sure we're not gone while camp is in session, and she's even planned out what year it will be when she can be a junior counselor! When asked about her favorite aspects of camp, Hannah replied, "All of it!" But when pressed for details she responded, "I really like learning about different countries. I also love all the storytelling, the active games, and making a scrapbook so I can remember camp when it's over." We believe that Kids and Cultures has sparked her interest in the world. She devours each new issue of National Geographic and can be found studying the globe in her spare time:) Additionally, it's been a powerful experience for her to realize that people from all over the world live here in Lancaster. By including guest presenters from the countries visited, Camp puts a face to those distant countries. As a parent I can say that everything about Kids and Cultures is of the highest quality. Also, it's a good camp for all kinds of kids as they alternate between story telling, active, outside games, crafts from the country, and the perennial favorite, food tasting from around the world. This camp is a gem, and I would highly recommend to families looking for educational yet fun enrichment during the summer. 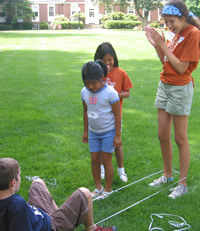 "A variety of cultural learning and awareness in a respectful way"
Photo: Dulce finishes a jumping sequence as her junior counselor Arianna cheers her on, at Kids and Cultures Camp 2009. We love Kids and Cultures Camp. Dulce was first introduced to Kids and Cultures Camp as a very young guest representing her birth country of Guatemala. Since that time she eagerly awaited the day she would be old enough to go to camp. Now she has 2 summers of enjoying Kids and Cultures Camp under her belt, and is already looking forward to this summer's camp. When asked about camp, Dulce especially likes the special guests "because they give us interesting information about their countries and dress up in clothes from their country. Also, the crafts are cool!" As a mother who grew up in a lowtech environment and among varied cultures and foods, I appreciate so much about what my daughter experiences at camp - the variety of cultural learning and awareness in a respectful way, the lowtech games and activities which can be enjoyed without materialistic consumption, the oral storytelling which is a rich tradition among so many cultures, the sampling of new foods, and meeting persons from the cultures they are exploring during camp. These are gifts I had hoped to pass on to my daughter, and Kids and Cultures Camp helps me to do this. Thank you! "Thank you for setting up this camp"
Photo: Coleman (right) and fellow camper Anthony inspect a Polish craft during Kids and Cultures Camp 2009. Photo by Matt Lester, Matthew Lester Photography. Thank you for setting up this camp. My favorite part of the camp was when we made the scrap book. I liked putting the pictures of the visitors and the location of the country on. I also liked how we put in things about each culture. I like to look at my scrap book so I can see all the work I did about the countries. We loved the snacks!!!!!! I loved learning about Poland, The Gambia, El Salvador, Iraq, and Nepal. We liked the games and making the crafts too. My favorite craft was the Bagh-Chal game. I liked how you would get the stamps for the passport when you visited the country. Thanks again, Avery and Coleman. 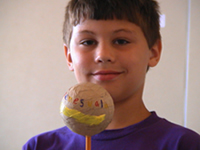 Photo: Julian shows a maraca he made and decorated at Kids and Cultures Camp 2008. We sent Julian to Kids and Cultures Camp to broaden his world understanding, and because friends of ours had recommended it. It far exceeded our expectations! He has a great time learning about other children in other places around the world. Understanding and appreciating diversity is so important in today's world, and Kids and Cultures Camp does this really well. Julian says that camp helps him be open to new ideas and different ways of doing things. Julian especially likes making the scrapbooks and playing the games from each different country. I would recommend the program wholeheartedly to anyone! Julian says, "Making the scrapbooks is really fun, and playing the games from each different county. I like getting to be with other kids and being creative while learning about other countries." 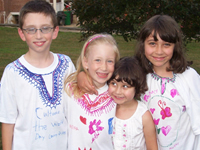 Photo: Dustin (left) and Brianna (second from left) with friends at Kids and Cultures Camp 2005, wearing T-shirts they decorated. Our children were excited to not only be introduced to a new country through stories, crafts, games, and snacks...but also to meet a national from each of the countries they visited! They heard stories and learned some language from the guests and it made a big impact on our children. It's easy to read about other countries in books, but it's long remembered when you get to listen to the guests accent, hear spoken word in conversation, eat food that is customary in the country, see the guests' photos, play games, and have the opportunity to ask many questions that come up in the process and receive immediate answers! And at the end of the day, our children were able to scrapbook their experiences, take a picture with the guest and have a forever memory to refer back to! Now that Dustin and Brianna are too old to attend camp as guests, they look forward to volunteering each year. They are excited to be able to continue learning about different countries, while helping other campers get the most out of their camp experience! As a parent, I can't say enough about Kids and Cultures Camp. I've volunteered for many of the camps and continue to be impressed with the quality of the camp, and the enthusiasm of the Wenger family and other leaders. This is a great opportunity for all of our children to learn positive and exciting things that are happening outside of the United States. Your children will have a rewarding experience that will surely be remembered long after camp has ended!